"Certainly, in the Basin and Range, it's a hazard that is vastly underestimated," he said. 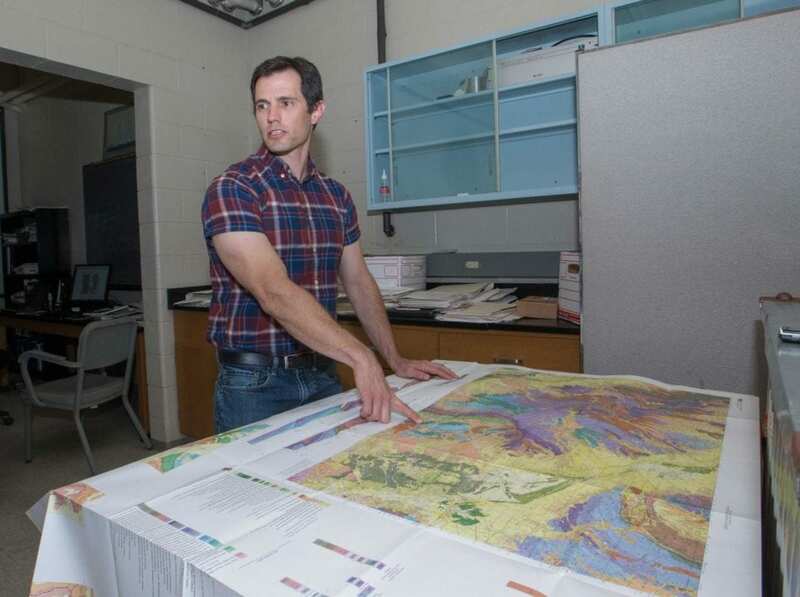 Sturmer, an assistant professor of geology in UC's McMicken College of Arts and Sciences, is working with the Nevada Bureau of Mines and Geology to add specific details on landslides to the state's map of known hazards. The interactive map includes areas prone to wildfires, flash-flood zones and earthquake fault lines. "These failures frequently occur in El Niño years when you have a lot of rain. Fires exacerbate the problem because you don't have vegetative roots holding the soil in place. And then you get heavy rains," he said. Sturmer presented the project to the Geological Society of America conference in Indianapolis in November. Landslides are never far from the popular imagination. The phrase "won by a landslide" has been in use in connection with elections since at least the 1840s. In his 1880 book "A Tramp Abroad," humorist Mark Twain wrote of a famous landslide in the Swiss countryside that destroyed four towns 74 years earlier. "A constant marvel with us as we sped along the bases of the steep mountains on this journey was not that avalanches occur, but that they are not occurring all the time," he wrote. "One does not understand why rocks and landslides do not plunge down these declivities daily." UC geology graduate student Nicholas Ferry has been studying the Blue Diamond landslide south of Las Vegas, Nevada. "Las Vegas has grown very rapidly over the last 20 years. Development is approaching this area where potentially another landslide could happen," Ferry said. But Ferry said the region with the most landslides ironically is home to the world's oldest mountains: the Appalachians. Ferry decided to come to UC to study geology because of its in-depth work on landslides. "Of all the schools I applied to, UC was doing the most interesting work. I jumped all over it," Ferry said. "It's been pretty exciting." Landslides hold tremendous potential energy. In the textbook "Geology of California," authors Robert Norris and Robert Webb wrote about the incredible force behind an Ice Age landslide in the San Bernardino mountains called Blackhawk. It's one of the most-studied landslides in the United States, Sturmer said. "As the slide moved down the canyon (at 170 mph), it passed over a ridge that crosses the canyon and was thus launched into the air — a geologic version of a flying carpet," Norris and Webb wrote. Rocks from the slide reached top speeds of 270 mph as they fell more than 4,000 feet and came to rest more than 5 miles away. Sturmer said evidence of that slide is still evident today, despite thousands of years of erosion. "It's one of the most-studied landslides in the region. The mountain failed on a ridge. The falling rock was supported on a cushion of air as it traveled," Sturmer said. Nevada's Bureau of Mines and Geology gives residents detailed information about their local risks of natural hazards through an interactive online map, said Rachel Micander, a cartographer for the agency. "The web application contains data on earthquakes, floods and wildfires, the top three natural hazards in Nevada," she said. "We also have information on radon. But there is very little about landslides now." She studied geology under Sturmer at the University of Nevada, Reno. "We have a few types of landslides in Nevada and across the country. There are records in the geologic strata of these types of landslides happening across Nevada," she said. Landslides pose a legitimate risk because development is expanding to areas that can become unstable under the right conditions, she said. "Reno sits in a valley. As the population grows, we're building higher up on the mountain slopes," she said. "We've seen debris flows recently in the Carson City area." The hazard map gives residents information to prepare for the most likely natural disasters nearest them and to make smart decisions about where to build, she said. "That's the goal of the project, to develop a tool for Nevada citizens to make educated decisions about their community. Learn about hazard risks," she said. "A lot of people don't realize Nevada is earthquake country." Micander said people accustomed to earthquakes take precautions such as securing bookcases to the walls and not placing heavy objects like picture frames or unsecured shelving over beds. "A lot of these hazards are fairly easily mitigated," Micander said. "I know open shelving is trendy. But I keep the doors on my closets and cabinets. Mom always put a wooden spoon through the handles to secure the kitchen cupboards." In addition, the digital map identifies the risks of radon, a colorless, odorless toxic gas that can seep into homes from underground bedrock and the water table. It's one of the leading causes of lung cancer in the United States. The Centers for Disease Control and Prevention recommends people test their homes for radon exposure and make repairs, if necessary, to limit future exposure. Micander said she would like to incorporate Sturmer's new landslide data in the hazard map. So far, he has identified about 70 sites of landslides or landslide-prone areas. He has visited about a dozen of them but plans to study more in person. "Most of them either haven't been studied at all or have been studied very little," he said. "It's been a fun hunt to look for them. It seems every time I go looking for them, I find more."